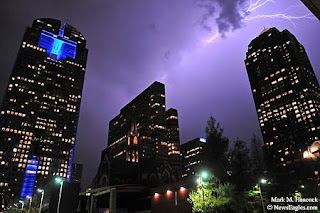 Lighting illuminates part of the downtown Dallas skyline over the Arts District in Dallas on Sept. 29, 2011. This is a collection of my favorite shots (it isn't all PJ work) from 2011. On a computer or iPad, it's best to view the slideshow in the larger format. 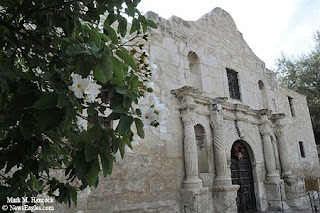 Fayrouz Hancock tours The Alamo in San Antonio on Nov. 25, 2011. Fayrouz Hancock tours The Alamo in San Antonio. Please also see Fayrouz's slideshow. The golden alter at San Fernando Cathedral reflects lights on Nov. 26, 2011. Fayrouz Hancock tours the San Fernando Cathedral, St. Mary's Church and St. Joseph's Church in San Antonio. 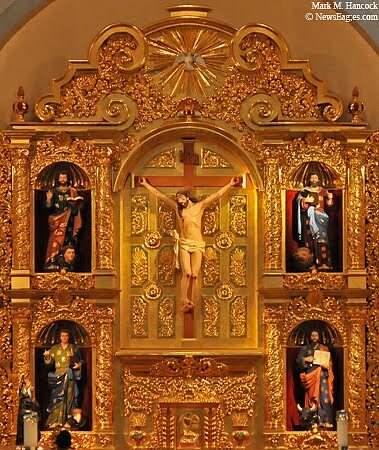 Please also see Fayrouz's slideshow of the churches. 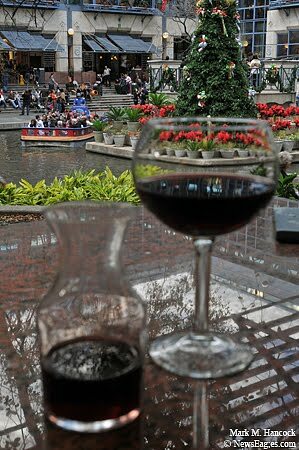 A carafe of wine accompanies lunch at the Luciano restaurant as a barge navigates the cove inside Rivercenter Mall in San Antonio on Nov. 25, 2011. 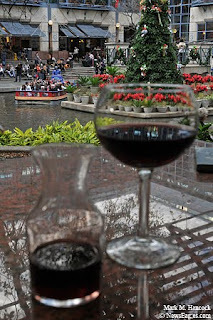 San Antonio turns on the lights near The Alamo and along the Riverwalk during Thanksgiving weekend 2011. Southlake Carroll senior Matt Swoyer (30) tries to intercept a pass intended for Arlington Martin junior Eric Hughes (88) during the Class 5A Division I Region I championship football game at SMU's Ford Stadium in Dallas on Dec. 3, 2011. 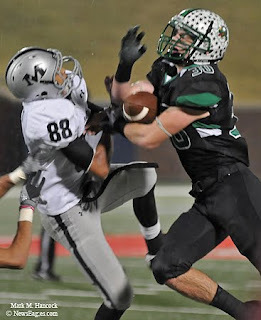 Southlake Carroll battles Arlington Martin during the rainy Class 5A Division I Region I championship football game at SMU's Ford Stadium in Dallas. 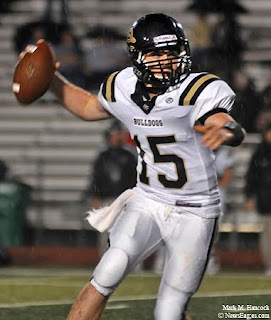 The winner advanced to the state semifinals game. Named in this slideshow are: Eric Hughes, Dustin Flegle, Brodie Lambert, Kyle Hicks, Ben Sego, Stephen Amoako, Will Davis, Jeff Miller, Kenny Hill, Cameron Williams, Peyton Williams, Tanner Jacobson, Eric Hughes, Chris Turner, Cedric Fernandes, Nick Melocik, Matt Swoyer, Tony Holmes and Sabian Holmes. 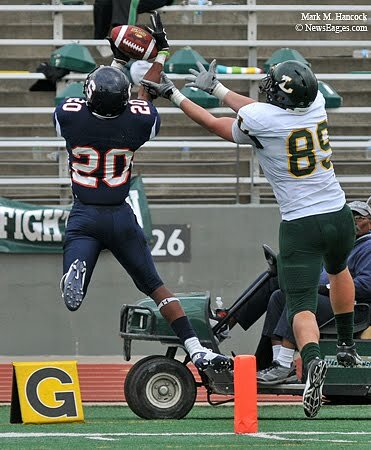 Sachse senior Aaron Ballard (20) tries to pick off a pass intended for Longview senior Braden King (89) during a football playoff game at Kincaide Stadium in Dallas on Nov. 19, 2011. Sachse battles Longview during a football playoff game at Kincaide Stadium in Dallas. 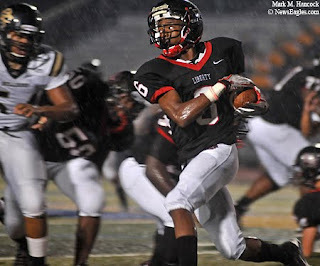 Named in this slideshow are: Billy Cole, Corey Bartley, Trent White, Brandon Durr, Nakia Brown, Jalen Porter, J'Haston Faggans, Deontre' Wilson, Bivins Caraway, Larry Thomas, Tyrique Edwards, Davatric Cooks, Jeff Guckenberg, Kent Myers, Aaron Ballard and Braden King. Conrad junior Dominique Jones (4) bobbles a pass in front of Frisco Centennial senior Austin Conrad (16) during a Class 4A football second-round playoff game at Kimbrough Stadium in Murphy on Nov. 18, 2011. 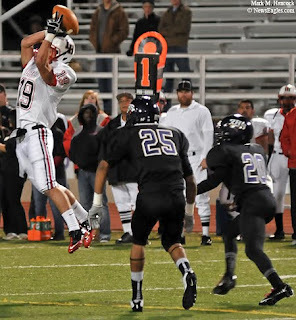 Conrad battles Frisco Centennial during a Class 4A football second-round playoff game at Kimbrough Stadium in Murphy. Named in this slideshow are: Lamar Jordan, Deandre Jones, Jordan Miller, Kevin Smith, Silas Jefferson, Alex Kellum, Taydren Young, Ian Neithercut, Chaddrick Thomas, Darian McMahon, Jonnie Small, Zach McCown, Dominique Jones and Austin Conrad. 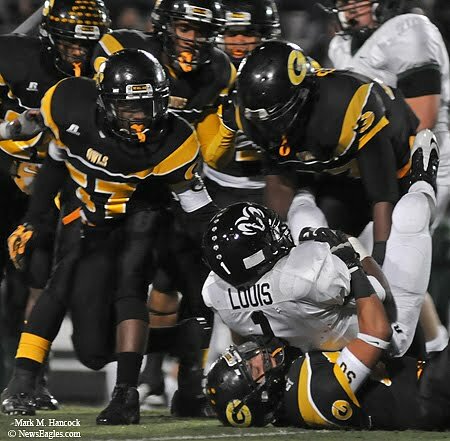 Berkner junior quarterback Yedidiah Louis (1) is wrapped up by Garland senior Ruben Fonseca (50) as other Owls surround the play during a Class 5A first-round high school football playoff game at Williams Stadium in Garland on Nov. 11, 2011. 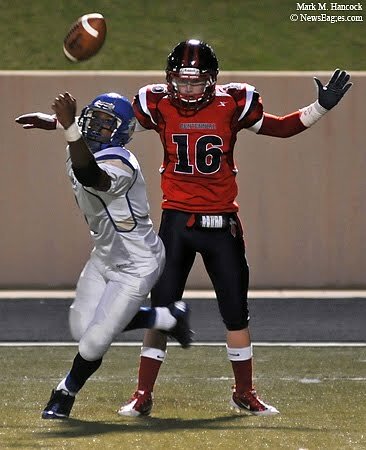 Berkner battles Garland during a Class 5A first-round high school football playoff game at Williams Stadium in Garland. Named in this slideshow are: Jaylon Terrell, DraShane Glass, Ja'Taveon Green, Xavier Ezenagu, Moses Reyes, Trey Caldwell, Yedidiah Louis, Seth Russell, Keylan Spencer, Rudy Aleman, Fred White, Ruben Fonseca, Gabe Horn, Sirderrious Caldwell and Nick Horton. 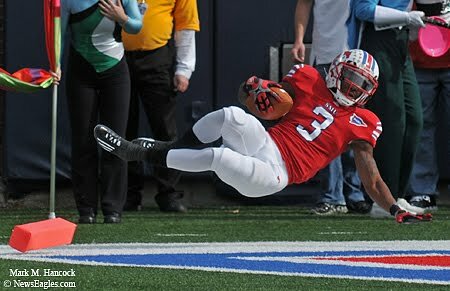 SMU wide receiver Darius Johnson (3) flies into the end zone for a touchdown against Tulane during a college football game at Ford Stadium at SMU in Dallas on Nov. 5, 2011. Southern Methodist University battles Tulane University during a college football game at Ford Stadium at SMU in Dallas. 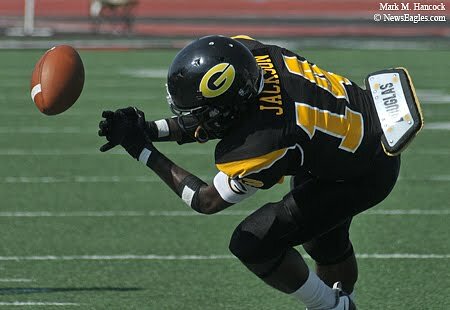 Named in this slideshow are: Marquis Frazier, Taylor Thompson, Ryan Griffin, Zach Line, Austen Jacks, J.J. McDermott, Eric Jones, Aaron Davis, Darius Johnson, Ryan Travis, Der'rikk Thompson, Terrance Wilkerson, Jordan Sullen, Ja'Gared Davis, Orleans Darkwa, Margus Hunt, Taylor Reed, Cole Beasley, Trent Mackey, Robert Kelley and Chris Castro. Lake Highlands senior Zack Fleig (19) makes a reception as Richardson sophomores Noah King (25) and Kimbrick Jones (20) react during a high school football game between Richardson and Lake Highlands at Eagle-Mustang Stadium in Richardson on Nov. 4, 2011. Lake Highlands battles Richardson during a high school football game between Richardson and Lake Highlands at Eagle-Mustang Stadium in Richardson. Named in this slideshow are: Parker Smith, Michael Ketchmark, Jacobi Johnson, Zack Fleig, Noah King, Kimbrick Jones, Michael Wright, Devonte Branch, Nick Thurman, Elbert Landry, Cameron Booty, Randall Howard, Garrett Reeves, Dalyn Hughes, Oscar Crosby and Scott Smith. 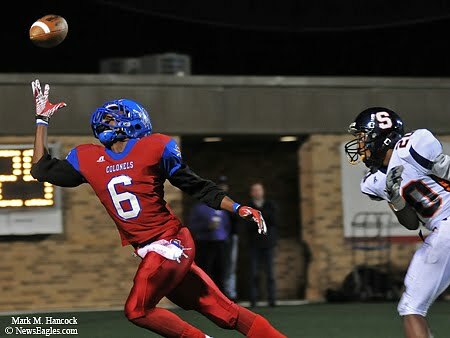 South Garland senior Rashaad Dorsey (6) makes a one-handed catch for a touchdown after Sachse senior Aaron Ballard (20) tipped the ball during a high school football game at Homer B. Johnson Stadium in Garland on Oct. 28, 2011. 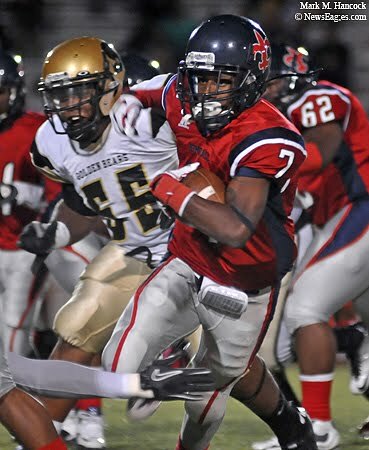 South Garland battles Sachse during a high school football game at Homer B. Johnson Stadium in Garland. Named in this slideshow are: Billy Cole, Dequincy Anderson, Trey Porter, Marquel McNac, Aaron Ballard, Marcus Hubbard, Tyler Holmes, Rashaad Dorsey, Jeff Guckenberg, Ezekial Spellman, Xavier Carroll, Regi Petterson and Trent White. 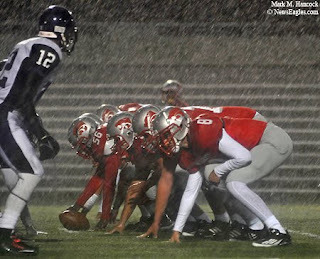 Woodrow Wilson's offensive line settles in against Lincoln's defense as rain pours on the field during a high school football game at Franklin Stadium in Dallas on Oct. 27, 2011. 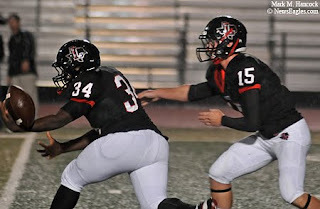 Woodrow Wilson battles Lincoln during a high school football game at Franklin Stadium in Dallas. Named in this slideshow are: Damian Garcia, Jhaylind Owens, Andre Plata, Cudares Brown, Jaren Phillips, Colin Spencer, Brenson Davis, Desmond Handy, William Mosquedo, Piers Christian, Jeremy Perkins, Erick Neal, Jeremy Fulcher, Derrick Neal, Sterling Turner and Shaquille Dottin. Kimball junior Prentavious Moorhead (17) makes a recpetion as Seagoville senior Ashton Rosebud (4) defends during a high school football game at James Ray Henry Stadium in Seagoville on Oct. 21, 2011. Kimball battles Seagoville during a high school football game at James Ray Henry Stadium in Seagoville. Named in this slideshow are: Kailion Hughey, Taylor Smith, Roland Hyder, Prentavious Moorhead, Tyler Hatton, Traveon Thibodeaux, Anthony Alexander, Xzavier Alexander, Eric Harris, Ashton Rosebud, Mike Jones and Aaron Cade. 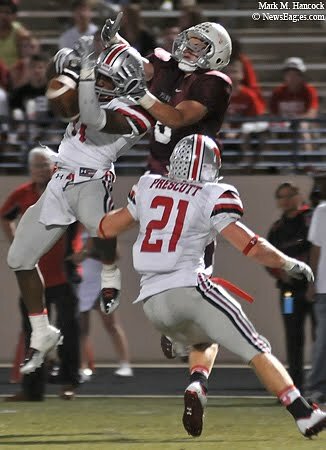 Flower Mound Marcus senior Jeff Smiley (11) breaks up a pass intended for Plano senior Sam Morell (8) as junior Court Prescott (21) assists during a high school football game at Kimbrough Stadium in Murphy on Oct. 14, 2011. Flower Mound Marcus battles Plano during a high school football game at Kimbrough Stadium in Murphy. Named in this slideshow are: Bobby Geibler, Cade Erwin, Jeff Smiley, Sean Oliver, Cole Erwin, L.J. Ausama, Joe Sikes, Richard Lagow, Sam Morell, Dylan Ward, Rakeem Crawford, Court Prescott and Sam Morell. North Mesquite senior quarterback King Davis (7) passes over DeSoto senior Michael Richardson (48) during a high school football game at Eagle Stadium in DeSoto on Oct. 7, 2011. 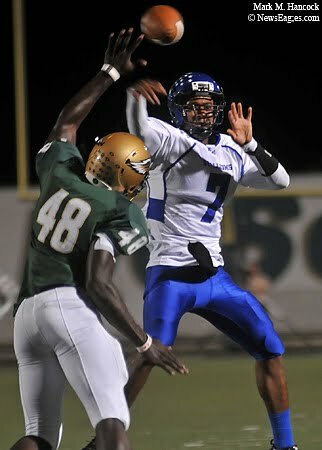 North Mesquite battles DeSoto during a high school football game at Eagle Stadium in DeSoto. 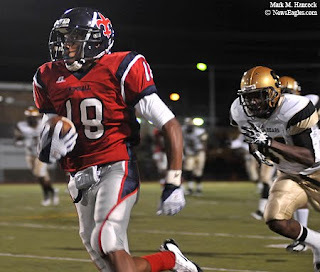 Named in this slideshow are: Reheem Wilson, Dontre Wilson, King Davis, Michael Richardson, Anthony Sims, Claude Mathis, Zack White, Vondrick Jackson, Tre' Jackson, Dontre Wilson, Justin Owens, Justin Backus and Nick Knox. 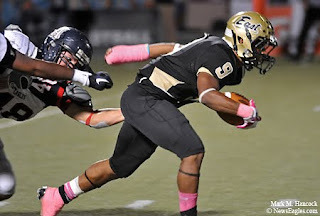 Plano East senior Nathan Meadors (9) breaks loose from Allen senior Sean McFarland (48) for extra yards during a high school football game at Kimbrough Stadium in Murphy on Oct. 6, 2011. 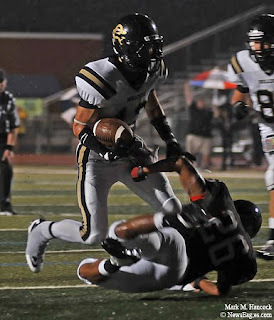 Plano East battles Allen during a high school football game at Kimbrough Stadium in Murphy. Named in this slideshow are: Collin Shaw, L.B. Bates, Corey Wesley, Oliver Pierce, Corey Bassett, Alec Morris, Jonathan Williams, Toby Obumseli, Tre Jones, Austin Przybyla, Kaleb Jones, Kimani Smith, Nathan Meadors, Brandyn Bolling, Jack Hawkins, Prince Sam, Chad Adams, Sean McFarland and Deandre Hill. South Oak Cliff senior Paul Franklin (28) rushes into Kimball sophomore Marcus Rowe (19) and senior Christopher Jones (6) during a high school football game at Sprague Stadium in Dallas on Sept. 30, 2011. 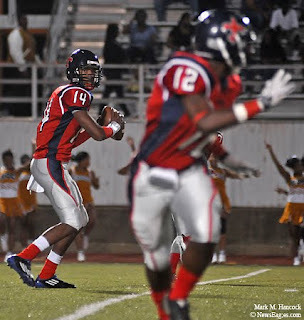 Kimball senior quarterback Jaalen Adkins (14) looks to pass the ball to junior Deonte Dawson-Jenkins (12) during a high school football game against South Oak Cliff at Sprague Stadium. 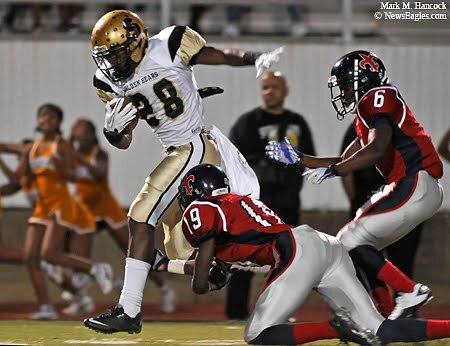 Kimball junior Teriyon Gipson (7) rushes as South Oak Cliff senior Adarius Wright (55) reacts during a high school football game in Dallas. Kimball senior Montan Mcbay (18) gains yards as South Oak Cliff junior Simon Jefferey (40) tries to catch up during a high school football game at Sprague Stadium. 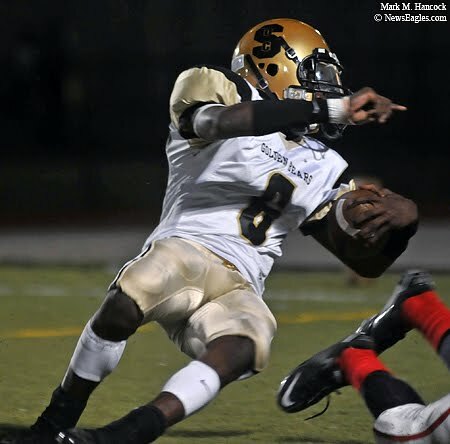 South Oak Cliff senior quarterback Jevone Valentine (6) falls across Kimball's goal line for a touchdown during a high school football game in Dallas. 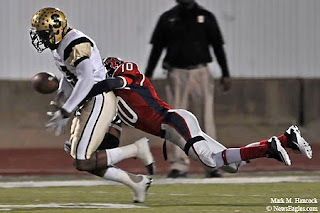 Kimball junior Brandon Hines (10) denies a reception to South Oak Cliff senior Corey Callicutt (15) during a high school football game at Sprague Stadium in Dallas. I got a new Plustek OpticFilm 7600I SE film scanner . This is the first test scan of a slide from Jan. 10, 1994. Now, I can start scanning all my old negatives and slides from the 1990s and beyond. I've been using one as an editor for the last three years, and it makes outstanding scans. I've posted various kinds of film for comparison. 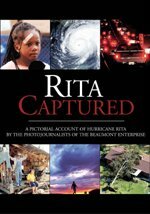 If you're looking for other holiday options (or tax write offs) for the photojournalist in your life, check out the The PJ Candy Store section of this blog. 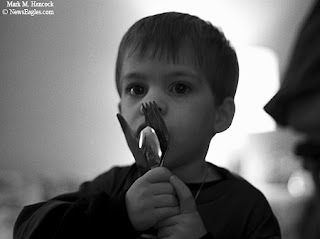 Will Hancock, my nephew, waits patiently for Christmas dinner on Dec. 25, 1992. He will graduate from Texas A&M this year. The image was made on T-Max B&W negative film. 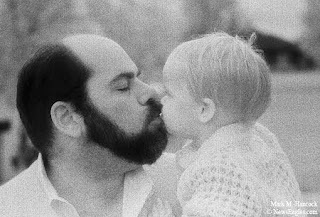 My brother Richard kisses his son, Jonathan Hancock, at my sister's home in Plano in 1992. 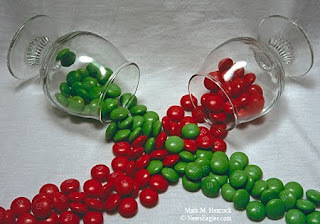 The image was made on Kodak Infrared film. 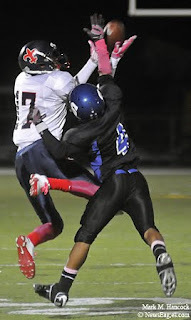 Molina senior Louis Clifton (48) nearly intercepts a pass intended for Adamson senior Quinton Vickers (6) as junior Thomas Chavez (11) defends during a high school football game at John E. Kincaide Stadium in Dallas on Sept. 23, 2011. 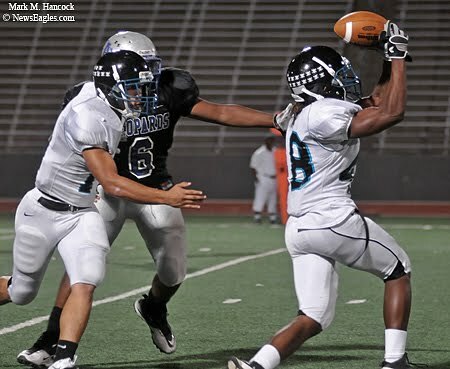 Molina battles Adamson during a high school football game at John E. Kincaide Stadium in Dallas. Named in this slideshow are: Carvon Culton, Qwaii Clark, Keith Jackson, Miguel Casassola, Julian Baeza, Ethan Henry, Ernest Salas, Louis Clifton, Quinton Vickers, Thomas Chavez, Miguel Ortega and Miguel Jiminez. Annie Kagerer, 12, of Frisco carries an umbrella onto the empty track during a lightning delay before a 4A high school football game between Frisco Liberty and Royse City at Memorial Stadium in Frisco on Sep. 16, 2011. 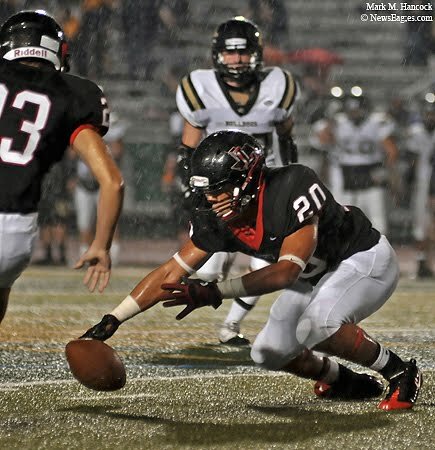 Frisco Liberty junior Aaron Estes (34) fumbles a wet handoff from senior Zach Smith (15) during a 4A high school football game against Royse City at Memorial Stadium. Royse City junior quarterback Wes Brookshire (15) looks for a receiver during a 4A high school football game against Frisco Liberty in Frisco. Royse City junior Michael Webb (12) leaps over Frisco Liberty senior Dwayne Warren (26) to score a touchdown during a 4A high school football game in Frisco. Frisco Liberty senior Kenneth Whittaker (20) scrambles to recover an onside kick during a 4A high school football game against Royse City at Memorial Stadium. Frisco Liberty senior Jeremy Embry (6) rushes against Royse City during a 4A high school football game at Memorial Stadium in Frisco. 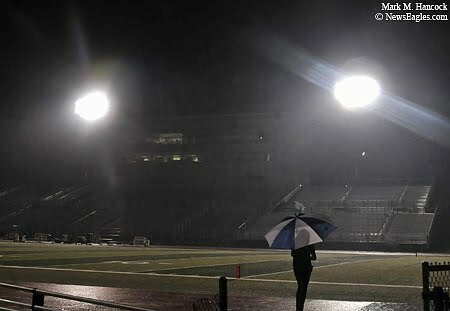 Due to lighting delays and an early deadline, all action images were shot in nine actual minutes (far fewer game minutes). Coppell's Jonathon Bell (32) starts to wrap up Jesuit junior John Berend (15) during a high school football game at Haggar Stadium in Dallas on Sept. 9, 2011. 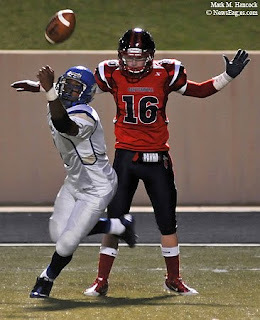 Coppell battles Jesuit during a high school football game at Haggar Stadium in Dallas. Named in this slideshow are: Tommy Shields, Jacob Logan, Jake Oliver, Jonathon Bell, Austin Lock, Ethan Evans, David Busby, Jaren Mccomb, JD Waggoner, Akuda Esin, Jordan Mastrogiovanni, Jake Williams, Jake Larson, John Berend, Marty Murad, Ben Wright, Soloman Thomas, Jack Brezette, JJ Gustafson, Tanner Masters and Preston Martin. 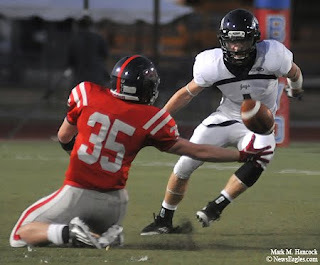 McKinney Boyd junior Benjamin Bouchez (35) and Flower Mound senior Beau LaFave (1) scramble for a loose punt during a high school football game at Ron Poe Stadium in McKinney on Sept. 2, 2011. 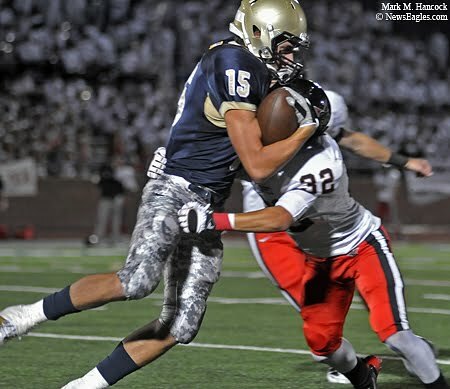 McKinney Boyd battles Flower Mound during a high school football game at Ron Poe Stadium in McKinney. Named in this slideshow are: Luke Penny, Ashleigh Hegwood, Marshall Williams, Beau LaFave, Robert Noren, Chas Taylor, Bryan Driskell, Brady Speckels, Colby Vinson, Benjamin Bouchez, Beau LaFave, Curtis Ladd and Jake Jaffe. Garland junior Tyler Jackson (14) misses a pass during a high school football game against Denton Guyer at Standridge Stadium in Carrollton on Aug. 27, 2011. Garland battles Denton Guyer during The Old Coach invitational football tournament at Standridge Stadium in Carrollton. Named in this slideshow are: Sebastian Williams, Sirderrious Caldwell, Jerrod Heard, Tyler Jackson, Jerrod Heard, Karl Burrell, Connor Crane, Ja'Taveon Green, Andrew Johnson, Damien Neroes, Kendre Bridges, Terence Belton, Ceon Rumphs, Rhiana Caterisano and Pooja Singh. 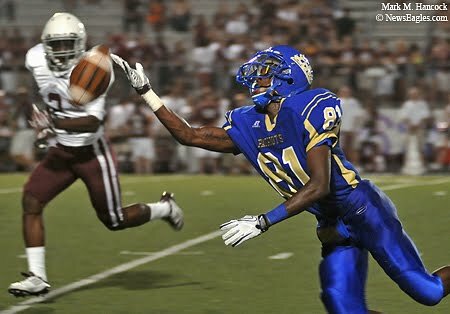 Lakeview Centennial sophomore Jarvis Baxter (81) reaches for a pass as Plano senior Marcus Davis (2) closes in during a 5A high school football game at Williams Stadium in Garland on 26 Aug. 2011. Lakeview Centennial battles Plano during a 5A high school football game at Williams Stadium in Garland. Named in this slideshow are: Valerie Sanches, Danielle Bush, Kevin Merrill, L.J. Ausama, Deonte Morrison, Richard Lagow, William Reese, Lance Lanier, Marquis Denmark, Rashad Dixon, Jarvis Baxter, Marcus Davis, Jacob Schnitzer and Drew Threadgill.